Update: More sheep have appeared, this time gracing Valkyria Chronicles 4's Steam page. Quite a few of them, in fact. They're gathering. How many sheep is the optimal number to announce that Catherine is coming to PC? We'll have to wait to find out. Confirming that these friendly farm animals are indeed heralding a Catherine PC port, the ESRB updated its rating (cheers, Siliconera), adding PC to the list. Sega's yet to make an official announcement, however, and there are still plenty of games that haven't been visited by woolly messengers. Original story: Sega’s slowly been bringing Japanese console games like Yakuza and Bayonetta over to PC, and it looks like the latest to make the leap is Atlus’ surreal puzzle platformer, Catherine. Sega hasn’t made an official announcement yet, instead opting to use a sheep as a messenger. Spotted by RobotBrush, this cheeky critter hiding away on the Bayonetta Steam page is a bit of a giveaway. 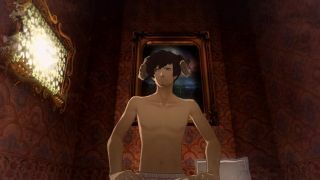 The nightmare realm where most of Catherine takes place is populated by other dreamers, all fellas, who look like anthropomorphic sheep. Like Vincent, the protagonist, they’re all climbing a treacherous, shifting staircase all night long. I wish I could get exercise while I slept. It’s an odd one. A simple but satisfyingly tricky action puzzle game by night and a relationship sim by day, Catherine isn’t really like anything else. At a push, the closest comparison would be Persona, which juggles RPG dungeon crawls with high school friendships and dates. Persona 5 director Katsura Hashino also served as director of Catherine. A new version of Catherine is due out on PS4 and Vita this year, but last year Kotaku spotted an Australian rating for a multiplatform version, Catherine Classic—it’s not clear which version is coming to PC. In 2017, Sega said it wanted to bring more games like Yakuza and Persona to PC, and since then we’ve seen Yakuza 0 and Yakuza Kiwami appear. We’ve had to wait for a while, but they’re still great additions to the PC library.